NSF-supported research uses supercomputers and simulations to improve storm forecasts. Computer models are the norm for predicting weather. NSF-funded SHARP model offers 6x better resolution. Supercomputers — Stampede and Darter — trained the new forecasting tool. When a hail storm moved through Fort Worth, Texas on May 5, 1995, it battered the highly populated area with hail up to 4 inches in diameter and struck a local outdoor festival known as the Fort Worth Mayfest. The Mayfest storm was one of the costliest hailstorms in US history, causing more than $2 billion in damage and injuring at least 100 people. Scientists know that storms with a rotating updraft on their southwestern sides — which are particularly common in the spring on the US southern plains — are associated with the biggest, most severe tornadoes and also produce a lot of large hail. However, clear ideas on how they form and how to predict these events in advance have proven elusive. 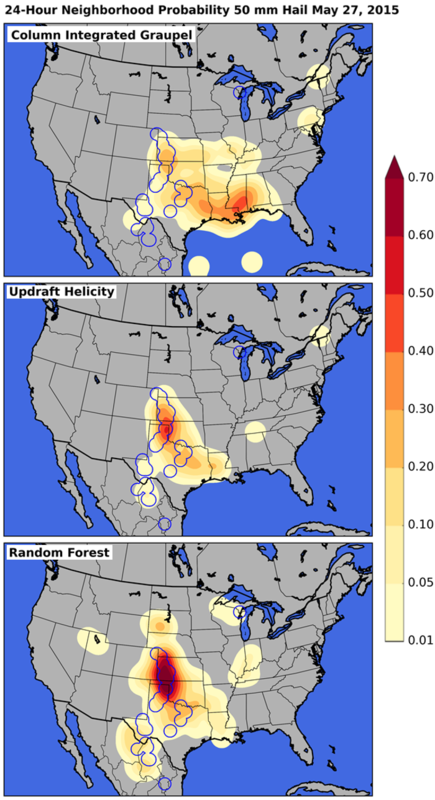 A team based at University of Oklahoma (OU) working on the Severe Hail Analysis, Representation and Prediction (SHARP) project works to solve that mystery, with support from the US National Science Foundation (NSF). 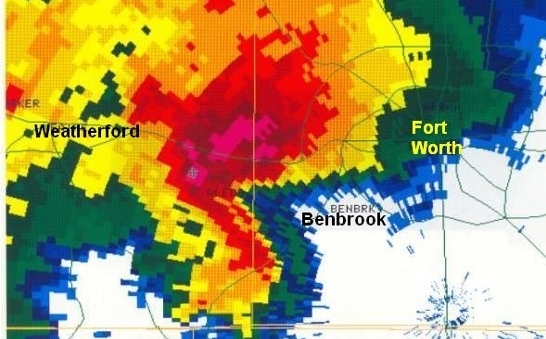 Performing experimental weather forecasts using the Stampede supercomputer at the Texas Advanced Computing Center (TACC), researchers have gained a better understanding of the conditions that cause severe hail to form, and are producing predictions with far greater accuracy than those currently used operationally. To predict hail storms, or weather in general, scientists have developed mathematically based physics models of the atmosphere and the complex processes within, and computer codes that represent these physical processes on a grid consisting of millions of points. Numerical models in the form of computer codes are integrated forward in time starting from the observed current conditions to determine how a weather system will evolve and whether a serious storm will form. Because of the wide range of spatial and temporal scales that numerical weather predictions must cover and the fast turnaround required, they are almost always run on powerful supercomputers. The finer the resolution of the grid used to simulate the phenomena, the more accurate the forecast; but the more accurate the forecast, the more computation required. The National Weather Service's highest-resolution official forecasts have grid spacing of one point for every three kilometers. The model the Oklahoma team is using in the SHARP project, on the other hand, uses one grid point for every 500 meters — six times more resolved in the horizontal directions. "This lets us simulate the storms with a lot higher accuracy," says Nathan Snook, an OU research scientist. "But the trade-off is, to do that, we need a lot of computing power — more than 100 times that of three-kilometer simulations. Which is why we need Stampede." Stampede is currently one of the most powerful supercomputers in the US for open science research. it serves as an important part of NSF's portfolio of advanced cyberinfrastructure resources, enabling cutting-edge, data-intensive computational science and engineering research nationwide. According to Snook, there's a major effort underway to move to a "warning on forecast" paradigm — that is, to use computer-model-based, short-term forecasts to predict what will happen over the next several hours and warn the public, as opposed to warning only when storms form and are observed. "How do we get the models good enough that we can warn the public based on them?" Snook asks. "That's the ultimate goal of what we want to do — get to the point where we can make hail forecasts two hours in advance. 'A storm is likely to move into downtown Dallas, now is a good time to act.'" With such a system in place, it might be possible to prevent injuries to vulnerable people, divert or move planes into hangers, and protect cars and other property. To study the problem, the team first reviews the previous season's storms to identify the best cases to study. They then perform numerical experiments to see if their models can predict these storms better than the original forecasts. Now in the third year of their hail forecasting project, the researchers are getting promising results. Studying the storms that produced the May 20, 2013 Oklahoma–Moore tornado that led to 24 deaths, destroyed 1,150 homes and resulted in an estimated $2 billion in damage, they developed zero to 90 minute hail forecasts that captured the storm's impact better than the National Weather Service forecasts produced at the time. "The storms in the model move faster than the actual storms," Snook says. "But the model accurately predicted which three storms would produce strong hail and the path they would take." The models required Stampede to solve multiple fluid dynamics equations at millions of grid points and also incorporate the physics of precipitation, turbulence, radiation from the sun and energy changes from the ground. Moreover, the researchers had to simulate the storm multiple times — as an ensemble — to estimate and reduce the uncertainty in the data and in the physics of the weather phenomena themselves. The team used more than a million computing hours on Stampede for the experiments and additional time on the Darter system at the National Institute for Computational Science (NICS) for more recent forecasts. The resources were provided through the NSF-supported Extreme Science and Engineering Discovery Environment (XSEDE) program, which acts as a single virtual system that scientists can use to interactively share computing resources, data and expertise. Though the ultimate impacts of the numerical experiments will take some time to realize, its potential motivates Snook and the severe hail prediction team. "This has the potential to change the way people look at severe weather predictions," Snook says. "Five or 10 years down the road, when we have a system that can tell you that there's a severe hail storm coming hours in advance, and to be able to trust that — it will change how we see severe weather. Instead of running for shelter, you'll know there's a storm coming and can schedule your afternoon."